Billy Graham wasn’t just passing through this world. He will return to stay, just like Jesus will. We all heard the Feb. 21 news and most of us posted the many articles, like this one. Graham died old and full of years. Most of those years he spent overtly preaching the gospel. This is not social or political causes, not religious morality, but the pure and simple gospel. This is the core of Christianity. They don’t make book covers like they made ’em in the ’70s. Rejoice. Graham also wrote plenty of books on Christian topics. I recall reading only one, the blessedly thriller-movie-esque-titled Angels: God’s Secret Agents (1975). I don’t remember much about it, just as I don’t remember much, if any, of Graham’s overt influence in my life. Rather, Graham’s influence has been subtle. It’s the kind of sway you sense is behind a lot of your life and society. If not for Graham, we probably wouldn’t have a lot of the Christian gifts we take for granted: evangelical subculture, for all its faults; multiple denominations of churches, aided by Graham’s popularity; and Christian media, including the Graham-founded Christianity Today magazine. Since last week, we’ve seen many more written and video testimonies from people who received salvation in Jesus thanks to the Holy Spirit’s work through Graham’s ministry. 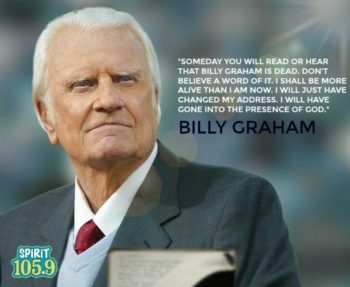 We’ve also seen many memes with Graham’s quote(s) about how he anticipates Heaven.2 And indeed, Heaven is where Billy Graham is today. For every Christian, Heaven is our eternal home. Or our eternal Home, capitalized, as many Christians do when they’re trying to get poetical about eternity. As in: she’s gone Home. Or: today all the suffering makes me long for Home. And yet: is that the end of Billy Graham’s story? Does he go up/over/across to Heaven, just as all Christian do after death, and then that’s it? No further action? No developments? Was Graham right to say: “My home is in heaven. I’m just passing through this world”? Or when he said, “This world is not our home; our citizenship is in heaven”? Right now, a home in Heaven is so perfect, in Jesus’s presence, that nothing is better. In the future, Heaven will get better anyway (and will even unite with this world). Scriptural evidence for each statement is bountiful, but I’ll overview just a few verses. When he [the Lamb, a symbol of Jesus] opened the fifth seal, I saw under the altar the souls of those who had been slain for the word of God and for the witness they had borne. 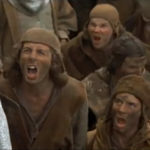 They cried out with a loud voice, “O Sovereign Lord, holy and true, how long before you will judge and avenge our blood on those who dwell on the earth?” Then they were each given a white robe and told to rest a little longer, until the number of their fellow servants and their brothers should be complete, who were to be killed as they themselves had been. But isn’t Revelation only symbolic? Yes/no/kind of/depends? Comparing Paul here with his own words of 1 Corinthians 15, we see that he’s talking about physical resurrection. That’s the biblical Christian belief that people don’t just die, leave their bodies, and go to Heaven as souls. Each one is destined to reunite with that same physical body, only Spirit-upgraded, which the apostle Paul calls a “spiritual body” (1 Cor. 15:44). Here, Paul says if your earthly “tent” or home (that is, your body) is destroyed, we don’t look forward to being “naked” in Heaven (that is, without a body). Instead, we want to be further clothed—a reference to the super-embodiment of resurrection. Here we see this again: Yes, Heaven now is incredible. Even if we don’t have a body, we’re present with the Lord, and that is “far better” (Phil. 1:23). But that’s not the fixed nature of Heaven. We’re not fully home yet, unless we are “further clothed” in resurrected bodies. Here the apostle is clear: “the creation … the creation … the creation itself” awaits its freedom, in the exact way God’s people await “the redemption of our bodies,” that is, physical resurrection. If we die, so does creation. If we live again, so does creation. Compare that with Isaiah 65’s promises of a “New Heaven and New Earth,” coupled with Revelation 21’s echo of this same phrase and glorious fulfillment under King Jesus, then the fact becomes clear: though Heaven is amazing, Heaven isn’t even in its final form. Heaven will morph—be supernaturally changed—blended, united, with this very renewed universe, “the creation itself.” This will make the true, eternal Home of New Heavens and New Earth. That means we can say “our citizenship is not in the world,” if by this world we mean this present, sinful, groaning age. But we can also say “our citizenship is in this world,” if by this world we mean a physical, beautiful and good universe, wholly renewed by King Jesus. And then, by the way, we can explore possible answers to questions like “could animals, including dead pets, go to Heaven?” or, “will we eat in Heaven?” or one of my favorites, “can we have amazing stories in Heaven?” If by “Heaven” we mean today’s Heaven, the jury’s still out. But things are slightly more definitive for New Heavens and New Earth. 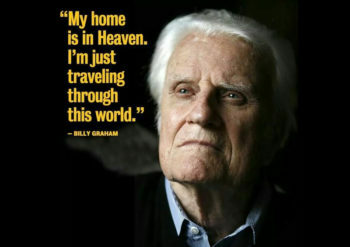 That’s why I say that yes, Billy Graham is already home. He’s home in Heaven today, worshiping Jesus and meeting the many people he’s helped bring there. That is amazing. 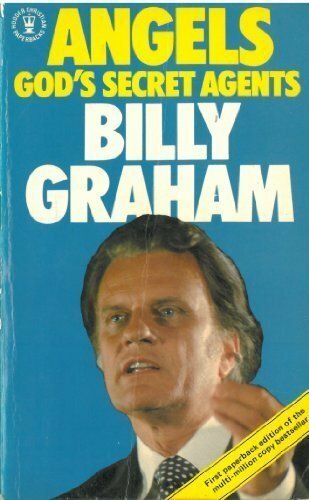 Divine plot twist: Billy Graham will return. But Billy Graham is still not yet home. Billy Graham wasn’t just passing through this world and his citizenship isn’t just in an out-there Heaven that will never get better. In fact, he will return, just like Jesus will return. He’ll land back on this world—a new Billy Graham for a New Earth. He’ll change his address again! He’ll be re-embodied, looking like those photos we’ve seen, but surely full of more energy and youth and age-wisdom than ever before. And if you believe in the Jesus whom Billy Graham loved, and the gospel Billy Graham lived to preach, then someday you can also land on New Earth with that same crowd of saints. You can live forever in this heavenly paradise, where we can live, love, sing, create, work, and go on adventures beyond our wildest dreams, all for the glory and honor of King Jesus. Well, yes, we can know he was right because that’s precisely what Scripture says. Not, “our citizenship is in New Earth.” I find it very sketchy to make affirmations that contradict what the Bible says! We only know certain things with certainty about life after this life, and we should not discard the very words that God’s Spirit breathed into Paul that we might have a right focus and orientation. And yet, I don’t contradict what Graham said there. What I’m suggesting is a second look at the assumptions we might read into that last term, that is, “heaven.” Our citizenship is indeed there. Scripture is so clear on this. And yet Scripture is equally clear about the future of this planet and its future combination with Heaven. At that point, Heaven has not ceased to be Heaven, or become anything less than Heaven–the very presence of God. It has simply filled the whole Earth with the knowledge of the glory of the Lord, as the waters cover the sea (Habakkuk 2:14). I know of no other way to understand this and other prophecies than a literal fulfillment. That’s just it: we don’t knows. Scripture doesn’t give us a lot about what it will be like, and I think we are wise to keep it there, in the “I’ll trust God for that” pile. I think it’s unwise to speak dogmatically about what we don’t know. Indeed, there’s much we don’t know. 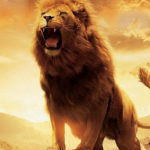 But based on the above clear texts, there’s also much that we do know, including the fact that “the creation itself” longs for its redemption just as humans do, and that something of human culture (kings, glory of the nations) will last into the Kingdom. 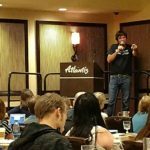 …..I like the differentiation of using “The Spirit world” to emphasize that Paradise and The New Heavens and Earth are different places. One of my frivolous works attempts to describe my own entry into the New Jerusalem, meeting my Master face to face in an unexpected place, and where I go from there. (“My Someday Journey. “) I have a large work in progress (“Nym is Blue”) in which a college student meets a high fairy and they are shocked to receive a mutual vision revealing they have a shared destiny having to do with the very creation of the New Heavens and New Earth, assisted by a fiesty little nine inch sprite. Almost everything I write is of this nature since I had an experience much like Paul of Tarsus that gave me unshakeable faith, endless joy and hope, and a loving desire to reveal the reason for what I have to others.